Generally considered to be a recently emergent European city, Tallinn is in fact one of the oldest capitals on the continent. First mentioned in history books in 1154, the capital of Estonia has been a meeting point and cultural melting pot since the days of Viking traders. Its spectacular Old Town – the best preserved medieval settlement of its kind in northern Europe – has secured the city a coveted place as one of UNESCO’s World Heritage Sites. 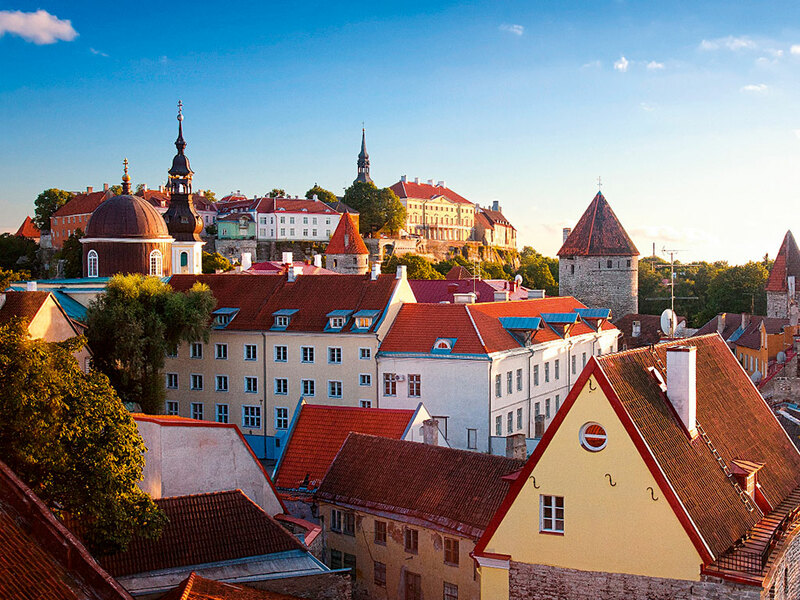 A rapidly developing and remarkably diverse city, Tallinn has a proud history of technical advancement that stems from its aptitude for innovation. Several of the city’s former industrial districts and sleepy urban areas have now established themselves as thriving communities, resourcefully using their own architectural legacy and cultural areas to attract locals and tourists alike. A modern business district in the city centre now completes Tallinn as a charming blend of old and new. Tallinn is widely recognised as one of the world’s most technologically orientated cities, offering cutting-edge solutions adopted by few other capitals. Its innovative online services include its e-government and e-banking initiatives, as well as mobile parking. The city’s airport, hotels, restaurants and public parks all guarantee free public Wi-Fi access, laying the foundation as one of the world’s most tech-savvy populations – while simultaneously being one of the most peaceful capitals in Europe. The city’s food culture harnesses the very finest flavours that the four seasons have to offer, providing fresh and locally grown ingredients throughout the year. A vast spectrum of cuisines is covered across Tallinn’s restaurants, from traditional Estonian gastronomy to much more modern fare. This is a city that is devoted to food and celebrates fine dining throughout the year with its multiple food festivals, including Tallinn Restaurant Week and Restaurant Festival. The city also provides diverse options for holding conferences. All of Tallinn’s largest conference venues are located within the city’s central area, close to the Old Town, airport and harbour, and are within walking distance of one another. Such convenience allows for more diverse programmes, with transportation requirements eliminated and opportunities for uniting venues seemingly endless. The number of international conferences hosted in Tallinn over recent years has shown an annual growth indicative of the city’s readiness to host a variety of key events. Tallinn’s array of conference venues date from between the 13th and 21st centuries, with each offering state-of-the-art technological equipment, quality services and a hospitable environment. One of the most architecturally significant locations is the Seaplane Harbour: built in 1916 and renovated in 2012, this maritime museum can accommodate receptions for up to 1,700 guests. Nordea Concert Hall is another city favourite, offering cinema halls as breakout rooms and a main hall with seating for 1,830 guests. Although small in size, the city’s versatility creates a wide range of possibilities for unforgettable incentives. Situated in the Gulf of Finland, allowing visitors to stroll along the idyllic seaside paths or taking sailing trips to the nearby islands, Tallinn’s fascinating history means that there is rarely a dull moment to be had. Untouched nature and an assortment of beautiful manor houses are just a 15-minute drive outside of the city, offering the perfect destination for a unique gathering. Tallinn has excellent daily flight connections from central European airports and Scandinavia. The city’s airport is small and tranquil, allowing for stress-free arrivals and departures only 10 minutes away from the city centre. While also offering fantastic value for money, with an array of five-star venues offering services at four-star prices, the convenience and friendliness of this diverse, green city make it a truly ideal location for meetings and incentives.